It's a common sentiment; usually uttered just after being stung, discovering a nest in an inconvenient place, or while competing with them for jam sandwiches and sweet drinks! I can't deny that wasps have their downsides, but fortunately for us gardeners they have important benefits too. My brother was not entirely correct when he assumed that wasps don't pollinate crops. Their smooth bodies don't collect pollen for transferring between flowers as well as those of hairy bees, but they are attracted to nectar and do carry out a useful amount of pollination in the garden. One type of wasp is incredibly specialised at pollination. Fig wasps, as you can probably guess from their name, pollinate fig trees. They are in fact the only pollinator of fig trees. One cannot exist without the other, so their importance to the fig growing industry and lovers of figs cannot be overstated! The tiny female fig wasp pushes into the figs through a tiny hole - so small that her wings are torn off in the process. If the fig is male, she'll lay her eggs and the larvae will then make their way out when they're ready. If, however, the fig (which is actually an inverted flower, not a true fruit) is female, there isn't enough space for her to lay eggs. She is trapped inside, dies there and is digested by the fig - but not before pollinating it. Nature is cruel but ingenious! The presence of social wasps such as paper wasps at barbecues and picnics, and their habit of building nests in sheds, house eaves and other inconvenient places is undoubtedly annoying (and occasionally painful). Yet there is a very compelling reason why it's worth tolerating them if at all possible: the prodigious appetites of their carnivorous offspring. Wasps spend their summers seeking out aphids, flies, caterpillars and other bugs - many of them pests - to feed to their larvae. Hundreds or even thousands of larvae can be produced each year in a paper wasp hive, so they get through a lot of bugs! As well as the familiar black-and-yellow social wasps, there are other kinds of wasp that provide essential pest control. Many kinds of solitary wasp will also hunt and kill insects for their larvae to feed on. Others are parasitic, such as the minuscule wasp Encarsia formosa which has long been used to manage whitefly in greenhouses. 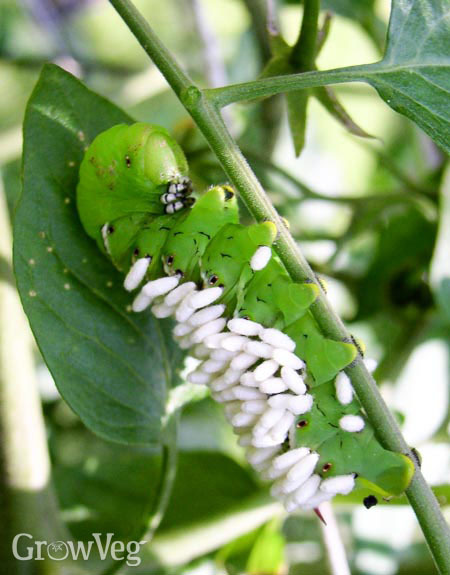 In the US, braconid wasps lay their eggs on tomato hornworms and other caterpillars, which are then eaten from the inside out as the larvae develop. Grisly but effective. The black and yellow striped pattern of many social wasps is such an effective warning that other bugs successfully use the same colour combination to persuade predators to keep their distance. Some species of hoverfly (also known as syrphid flies) are often mistaken for paper wasps or yellowjackets, but there are some clear differences to help you tell which is which. You can quickly and easily recognise a hoverfly by its shape and its eyes. They lack the very pinched waist of the wasp, while their large eyes are like wraparound sunglasses. Wasps on the other hand have smaller eyes that are on the sides of their head. Hoverflies will often hover almost motionless in the air in front of flowers. They are fantastic pollinators and pest predators themselves. Honeybees are sometimes mistaken for wasps too, but honeybees are furrier, duller in colour and fly with their legs tucked away out of sight. Despite their reputation, wasps are not unduly aggressive. However, waving your arms, swatting at them and trying to knock down their nest can fairly be interpreted by them as antagonistic - and they are not slow to defend themselves! Wasp venom contains a pheromone which signals to other wasps that they are under attack and need backup, so if you're stung once then other nearby wasps may join the fight. The best way to avoid being stung is to treat wasps with respect. Move calmly and deliberately, give them space to go about their business, and they will ignore you. If you do get stung, wash the area with soap and water and apply an ice-pack. You might want to take an anti-histamine tablet or use an anti-histamine lotion. If you are stung and have an extreme reaction - check the symptoms of anaphylaxis here - get to A&E fast. Wasps' nests are problematic, especially if they are in houses or sheds. Most people don't want to have wasps living alongside them, but wasps are so beneficial for their pest control capabilities that, if you can possibly leave the nest alone, it is advisable to do so. After all, wasps are so common that even if you can't see a nest, it's probable there's one nearby. Wasps are more strongly attracted to sugary substances in late summer. This is because their larvae convert the protein from the insects they're fed into a sweet liquid which the worker wasps drink. In late summer, when the larvae have all grown up, the adult wasps need to look elsewhere for fuel and this is when humans and wasps most often come into conflict. Winter freezes will kill off the workers and the old queen. The new queen will survive the winter and move on to start a new hive elsewhere, so if you want to move the nest in winter, you can safely do so.